Madda Lenna | Begin To Breathe. 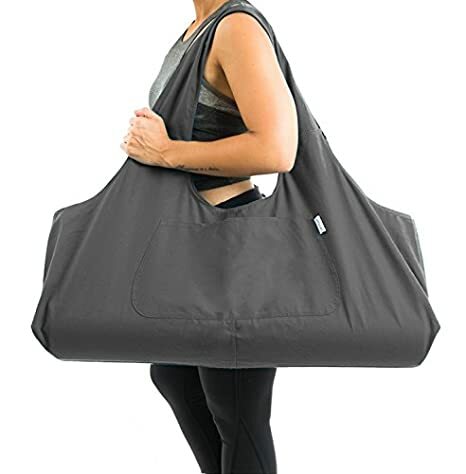 What Items Should Be in your Yoga Bag This Fall? The beginning of a new season means that it may be time for yogis to reevaluate the items they keep in their yoga bag. The extra towels and airy tank tops from summer can be retired in favor of more seasonally appropriate favorites. However, the space in a yoga bag is quite limited, so yogis need to ensure that each item taking up valuable space serves a purpose. What items are yogis favoring for the fall? The chill in the air means that you’re likely to feel cooler than usual at the end of your yoga practice. Ensure that your body will be covered appropriately to enter into the biting air outside of the studio with a light sweater. It is also great for keeping your body temperature stable and comfortable throughout the practice. As you prepare for resting poses and finishing sequences, it could be a great time to get comfortable with a light layer. When yoga studies and office spaces start to crank up the heat, your skin is more likely to become dry and cracked. Keeping a small bottle of lotion and a tube of lip balm handy allows you to hydrate your skin properly especially while performing Bikram yoga. It can help to prevent unwanted cracking and bleeding as the season progresses. High waist leggings are a must-have part of every yogi’s bag for the fall. They offer extra coverage and protection during class, as well as a little bit of additional warmth for the torso. Full yoga leggings are great to slip into comfortable boots at the end of class for a smooth transition to an on-the-town outfit. Depending on where you live, you may still be able to wear Capri leggings into the early fall months. Even the most seasoned yogi may find that their flexibility is a little lacking as the colder air comes. Fall can sometimes be a great time to reevaluate how far you move into a pose, respecting that your body may need something different during this time. Yoga blocks and straps are a welcome addition to your yoga bag to help you modify and stretch intensely even during these more difficult months. Take the time to utilize props to ensure proper alignment this fall. Some yogis may even want to consider carrying their own pillows or bolsters to make certain poses, such as the seated lotus or even savasana, a more comfortable experience. A blanket could be a multipurpose tool that fills both of these needs when appropriately folded. Many yogis understand the need to hydrate more during the sweltering months of summer. The fall season brings about just as much need to keep hydrated as the heat kicks on in our homes and around town. An extra few glasses of water, especially hot water, can help you to better circulate and detoxify your system during the cold weather. Consider an insulated water bottle that allows you to carry hot and cold beverages. If you’ve ever been to a Kundalini yoga class you might have noticed the teacher and several students were dressed in all white. This is because white clothing has a special significance in the Kundalini practice. Yogi Bhajan, the master of Kundalini yoga, believed that colors have an effect on our consciousness. White represents the seven colors and as a balance of all colors has a unique impact on the conscious and subconscious minds. He believed specifically that wearing all white clothing expands the auric radiance by at least one foot, which strengthens the identity and serves as a filter for negative influences. Wearing all white is a meditation in itself because it takes more mindfulness and care to keep white clothes clean, making the simple practice an exercise in awareness. “We ask you to wear white so that you will reflect what is outside and go within yourself – that’s what white clothes can do for you.” – Yogi Bhajan, 1975. Yoga philosophy defines the Kundalini as a spiritual energy or life force located at the base of the spine. Kundalini asanas combined with breath exercises free energy in the body and allows it to move upward along the spine. Kundalini differs from traditional yoga in that each exercise is performed for extended periods of 1-4 minutes to build strength and endurance. Combined with chanting to center the mind and assist with breathing, Kundalini yoga offers tremendous health benefits, especially for people who need low impact exercises and want to reduce stress. While the importance of wearing white for kundalini yoga is for spiritual reasons, comfort is also part of its purpose for modern yogis. Kundalini involves long meditations, series of movements, and breathing exercises for creating mental and physical endurance, reducing stress, and building core strength. To improve your practice your white uniform needs to be made up of flexible, comfortable, modest white clothing that allows for freedom of movement. Kundalini yoga clothes are probably different from what you wear for other yoga classes. Trappy tank tops shorts are perfect for a Bikram class, but you’ll feel out of place in a Kundalini setting. Try sticking to natural white fabrics, modest fitting pieces, and make sure your clothes are easy to move in. Also, make sure that your white clothing isn’t see-through or that you wear an extra layer underneath. So what should you wear to a Kundalini yoga class? Long Shirts – Peasant tops and tunics are popular favorites, but your shirt doesn’t have to be long sleeve. Short sleeves are better for arm movements. Just make sure your shirt is comfortable and functional. Casual hoodies are also ok but you might want to wear an extra layer underneath in case you get hot. Flowy Pants – Make sure your womens capri leggings are of the appropriate length so they will keep you comfortable and cool. Harem pants are a popular choice for that reason. Lofty genie pants are almost the same as harem pants and they are also ok and can be a fun option. 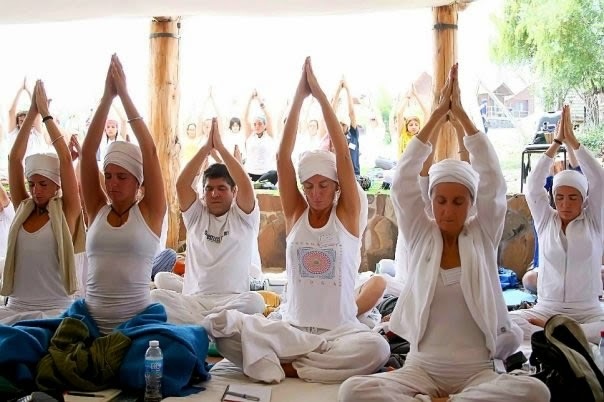 Regular white yoga pants are also acceptable in Kundalini classes. Any style that you find comfortable is a good option.